On Sunday morning we started the day the right way! We got out of bed on a dreich day and did something good for our community, something educational for the children and something memorable for us all. 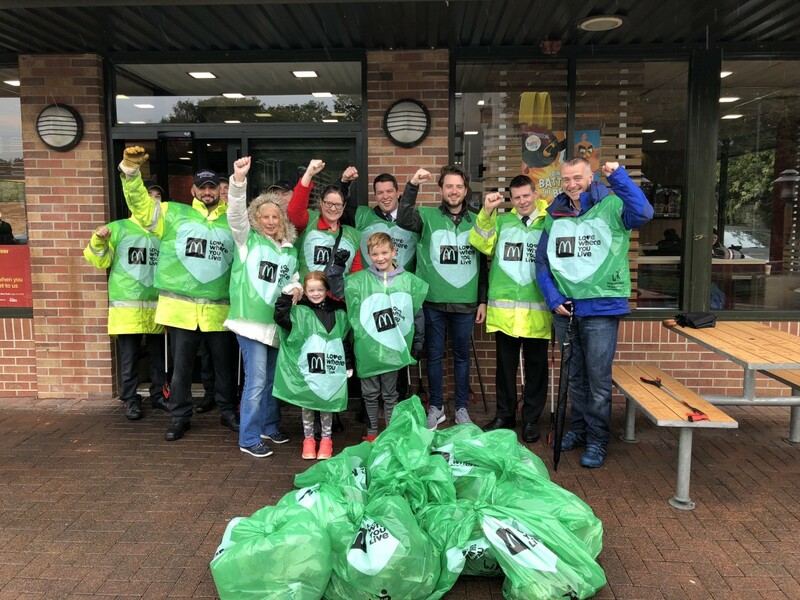 We headed down to McDonald’s at Thornliebank and met up with McDonald’s staff, franchise owner, manager and members of the public, all volunteering to help ‘Keep Scotland Beautiful’ as part of the Clean Up Scotland Campaign. 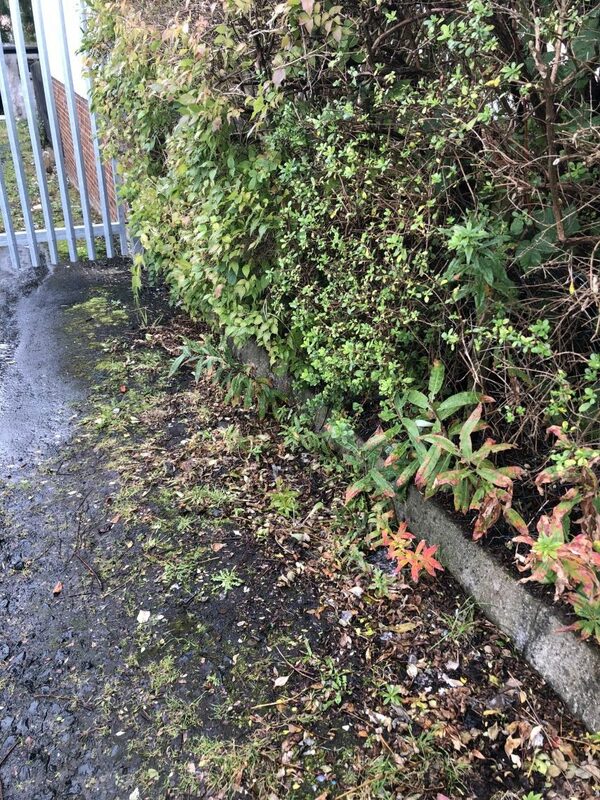 You may have seen that last week I asked my followers which area of Thornliebank you wanted to see us clean with the McDonald’s volunteers- and the area with the most votes was Orchard Park Avenue. 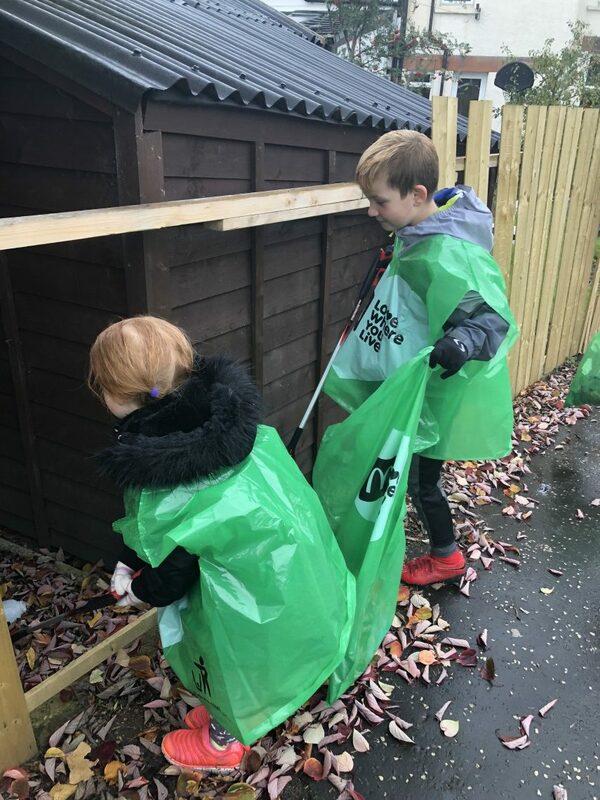 This was just one of the clean-up events that took place this weekend in partnership with Britmums. We each received our litter picker, tabard, gloves, rubbish bag and got our briefing for the day. The rain was pouring down, but that didn’t dampen our group’s spirits – we were raring to go, and it was a wonderful thing to be part of. Just look at all that litter. Everything from cans, to food packaging to sweet wrappers – it’s disgusting and it’s having a massive impact on our community. Not only does it look unsightly, but it’s harmful to the environment. 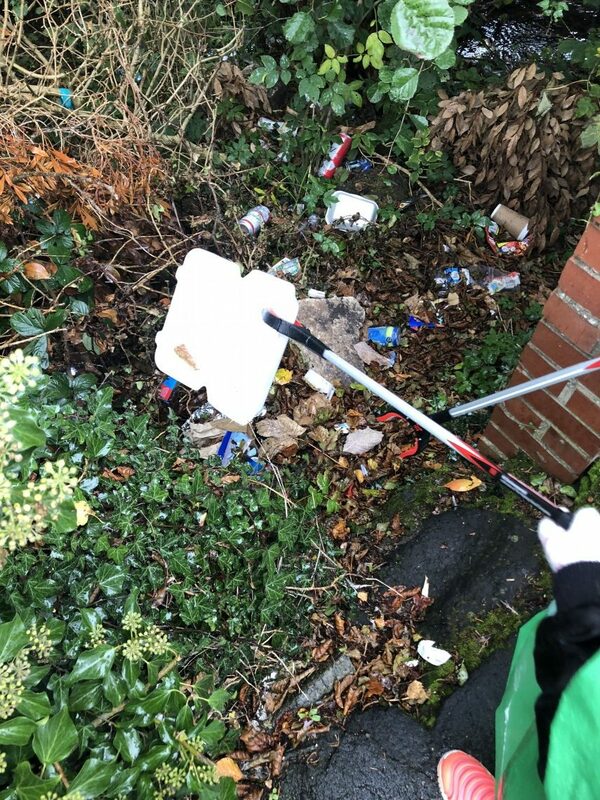 Did you know that McDonald’s is committed to helping our communities and the environment to help take positive action against litter throughout the UK? 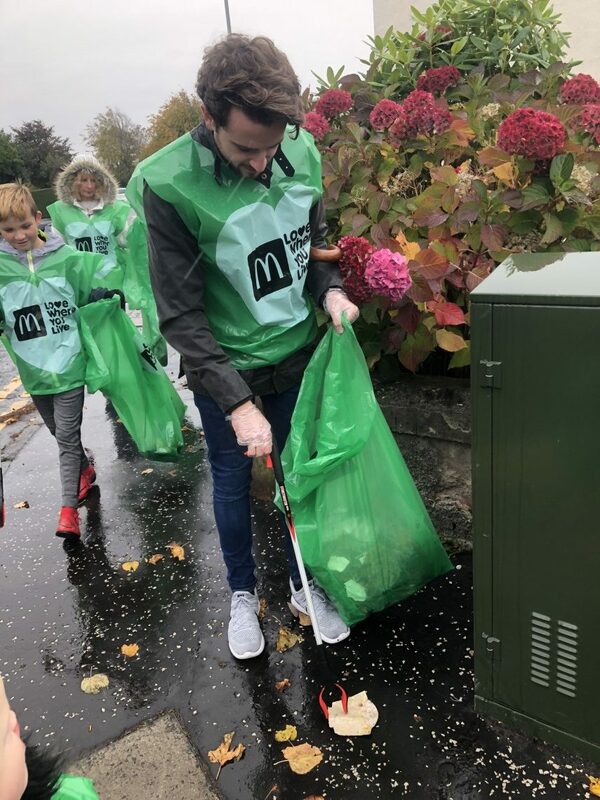 Since 2007, McDonald’s have been partners of Keep Scotland Beautiful and have taken part in hundreds of litter picking events as part of the ‘Clean Up Scotland’ campaign. If that doesn’t show commitment I don’t know what is. 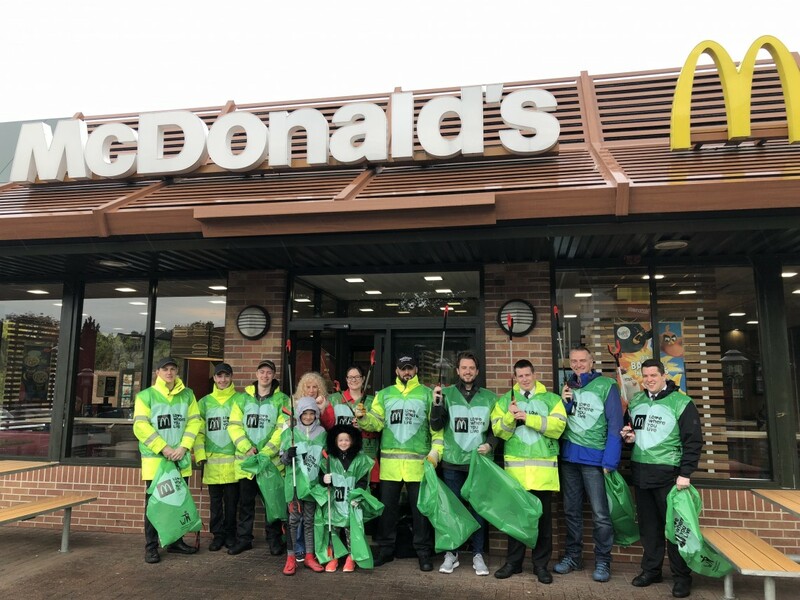 Everyone who took part in the clean-up were volunteers, with the McDonald’s volunteers giving up their own time to be involved. The litter pick was a lot of fun. Everyone was upbeat, despite the weather, and we made a small difference to a huge problem. We even had one member of the public come up to us and thank us for the wonderful job we were doing. Do you know what? That made every bit of it worthwhile, even if it gets us one more member of the public to spread the word and join in, it is a start in hopefully a domino effect. We can Keep Scotland Beautiful. We can Clean Up Scotland. The kids loved taking part. 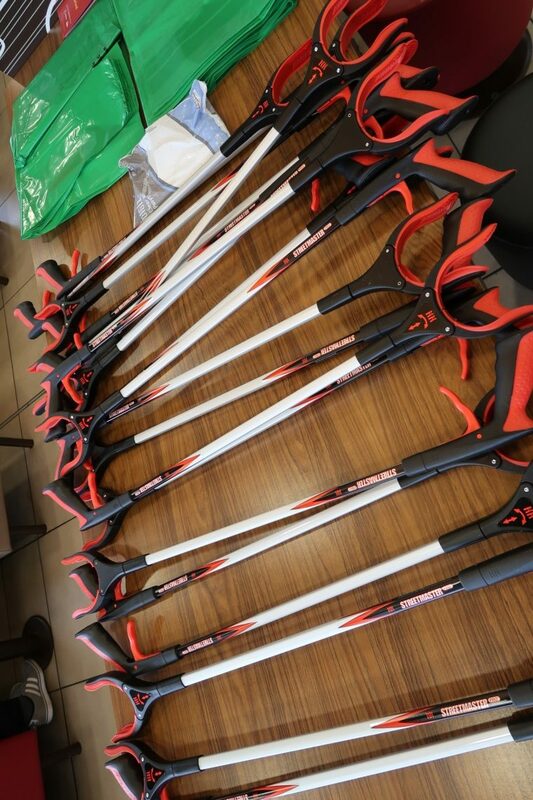 The novelty of the litter pickers, the fun of doing something different and being part of the group. They learned about many different types of litter and how wrong it is to discard that wrapper. The impact was huge for them to see those areas where it had gathered, that just one person dropping one piece, leads others to do the same. The items we were picking up, they were amazed had been discarded – full bottles or juice, forks, cartons of milk, which… well, stunk. I can safely say they are now going into school and telling all their friends never to drop little. Little Miss has added a litter picker to her Christmas list. She’s on a crusade now and do you know what? We all might get them. Let’s do this people, we CAN make the difference. This is such an important lesson to teach our kids and seeing this first hand, really was a life lesson. Seeing the difference in the photos above from the areas covered in litter to the parts now cleaned like above by us was hugely satisfying. I spoke to some members of the McDonald’s crew about how they tackle litter on a day to day basis. They told me that they go out three times a day and clean up the area around their restaurant. Then three times a week or more they go into the wider community and pick up litter, every week! It is not just McDonald’s litter either. They pick up all litter. I was pleasantly surprised by this. They were all proud to work for such a great company and took pride in the job they did for the community. I think it’s great. While I was taking part in the Clean Up Scotland Campaign with McDonalds UK I was given the opportunity to speak to the Thornliebank branch owner and find out his thoughts on the campaign and why he feels it’s important to take part in this video. McDonald’s aren’t only trying to help the environment with its litter pickups, they also run their delivery vehicles on recycled biodiesel from cooking oil for the last 10 years and plan to start rolling out paper straws to all its restaurants in the near future. Every little bit helps. In the end, we gathered a whopping 13 bags of litter. Incredible in one stretch of street. I have no words on why there was so much rubbish, but it was great to see the difference we made. Well done to our team, I was proud to be part of it, even my wee mum came along. It was a satisfying way to spend a Sunday, just a few hours out of day made a huge difference. My kids had fun and learned the effect litter has on the community. If you’ve been inspired to do your bit for this important cause, why not organise your own litter pick? I’d love to know your thoughts? 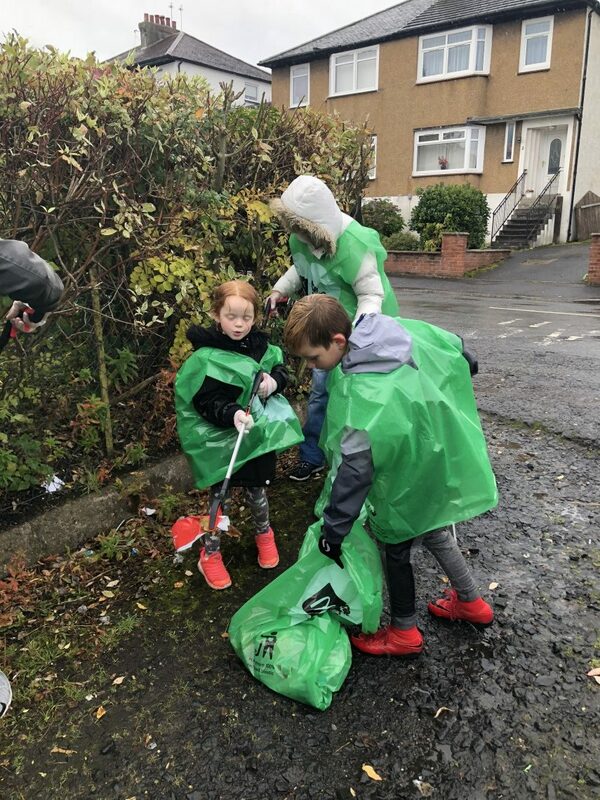 Disclaimer: This post is part of a paid project with McDonald’s UK and BritMums, promoting McDonald’s Love Where You Live campaign encouraging local communities to take action and work together to tackle litter in their area. Well done to you all! What a great thing to be a part of, but how sad that so many people still drop so much litter. I worked for McDonald’s over 20 years ago and they were always very good at cleaning up the area around their restaurants. I first did some litter picking with my son when he was a preschooler and it was in our local park. It was a surprisingly enjoyable afternoon and it felt good to make a difference. Since then he’s done it a couple of times with the cubs and the scouts. What a brilliant thing to be a part of. Well done to you all. That is so fantastic! I had no idea that McDonald’s did anything like this so well done to them to help the community in such a positive way. I think more companies should have initiatives like this and to get the kids involved is really positive too. I think this is brilliant Susan and what a great thing to get your kids involved in! I bet they actually really enjoyed it, doing something as a group is often really inspiring isn’t it? Aww well done to your little miss for her Christmas request!! This is such a great initiative and brilliant that McDonald’s is behind it. Wow you collected so much litter!! I love how you didn’t let the weather stop you from having a very productive day. It’s also great to see the franchisee owner present and to hear his views on tackling rubbish and working with the community. Thank you for sharing your day and well done for making such a difference. Wow Susan, that’s a lot of rubbish, literally. 🙂 It is a terrific campaign, and so wonderful getting the little ones involved. Btw, what does ‘dreich’ mean? You collected so much, well done. I think it’s so good that McDonald’s have initiatives like this. Ah thats amazing, well done to you all! You collected so much! 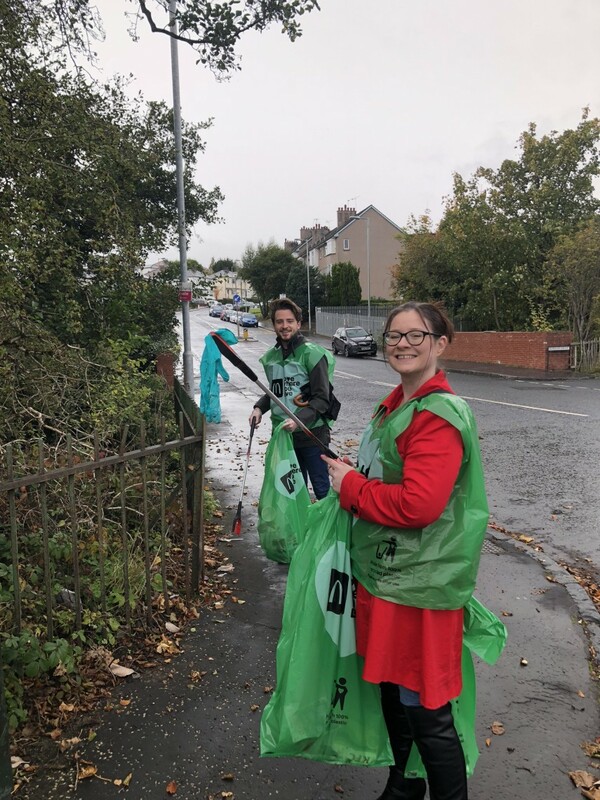 13 bags of litter is very impressive – well done! I really love the idea of this intiative!